The bandwidth indicator is used to identify situations where an instrument in a trading range or consolidation pattern is about to begin a directional move. Bollinger Bands form an envelope drawn many standard deviations above and below a moving average. Bandwidth measures the percentage difference between the upper and lower bands and therefore the volatility level. 20-period simple moving average and 2 standard deviations are the recommended parameters. However, different intervals may require different average and deviation calculations. 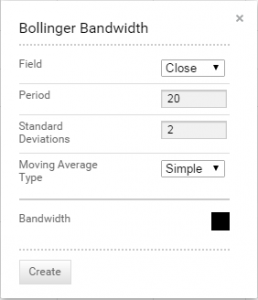 Typically, bandwidth parameters will match the user’s preferred Bollinger Band parameters. Technician defaults to the recommended 20-period simple moving average of the close with the bands drawn at 2 standard deviations above and below the average. The theory behind the bands is that the width of an envelope should be determined by the data-series itself rather than by the assumptions of the speculator, as done with percent envelopes. In this way, the envelope’s distance from the mean is a function of the market’s volatility. The bandwidth indicator allows for quick and objective visualization of expanding and contracting volatility periods over time. It also allows for comparisons across time for an instrument with a large change in price as well as to other instruments since the result is normalized for price level. The first step is to determine what constitutes narrow and wide bands for aninstrument. Bandwidth must be judged in comparison to recent history as well as in context to a longer period. Therefore, there is not one level of bandwidth that isnarrow or wide for all instruments and all times. This is like determining what it overbought or oversold with non-indexed momentum indicators such as MACD. John Bollinger postulated that volatility cycles from high to low and therefore Bollinger Bands also tend to expand and contract. Often, traders can get warning to a breakout from a flat period of trading when the bands start to expand. However, the direction of the breakout is not determined by band expansion alone. For that, traders must wait for prices to move above or below the bands to indicate the breakout in that direction. The chart of Woolworth shows several examples of narrow bands followed by breakouts and continued moves in the direction of the break. While it would have been possible to trade the breakouts on the price chart, the added dimension of the bandwidth indicator made the three highlighted higher confidence calls. Note how there was a breakout from a declining trend in April 2009 (between the first and second “narrow” captions). There was no signal from the bandwidth indicator and that could have been enough to keep the trading from taking the trade and enduring what appears to be a quick reversal. Can you see another instance where the bandwidth indicator would have helped? In February 2010, there was another signal for a buy.